On May 22, 2018, former State Bar of Georgia president Ken Shigley will be a candidate for election to the Georgia Court of Appeals. The only other candidate is Ken Hodges, a former Dougherty County District Attorney. Ken Hodges was the Democratic Party nominee for Attorney General in 2010. Strategy is essential in litigation. Among the most important strategic considerations is determining in which court a case may be litigated and tried. Most trucking crash cases involve an analysis of jurisdiction and venue questions. 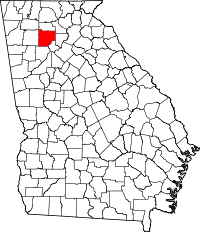 In Georgia state courts, cases must be filed in a county where a defendant is a resident. Federal courts are options if there is complete diversity of citizenship, meaning that all plaintiffs reside in a state different from all defendants, or if there is “federal question” jurisdiction. 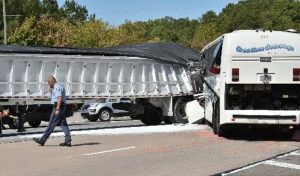 In tractor trailer crash cases, we usually but not always file in state courts in Georgia because of the relatively more user-friendly procedures in the state court system. Occasionally, we choose to file in a federal court when available rather than a small, rural county where the trucking company and its driver are located. Most often, plaintiff attorneys file cases in state courts against out of state trucking companies and drivers based on the Nonresident Motorist jurisdiction provisions which provide for venue where the crash happened or where the injured Georgia resident resides, Then the defense usually files a notice of removal to federal court under “diversity of citizenship” jurisdiction. Rarely does a defendant in a trucking case claim “federal question” jurisdiction in federal court. 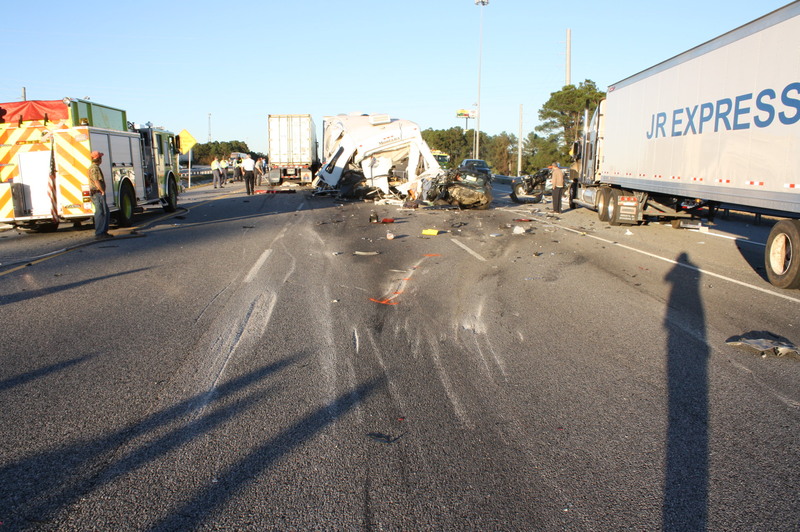 However, that happened in a case recently in which we are co-counsel in five of six cases arising from a tragic crash at the intersection of I-16 and I-96 in Pooler just outside Savannah, and preparing the briefs in all six companion cases. As the plaintiffs and two defendants are Georgians, there was no diversity jurisdiction. The last defendant served filed notices to remove all six cases from the State Court of Chatham County to the U.S. District Court for the Southern District of Georgia, claiming that the Shipping Act of 1984 created federal question jurisdiction. We immediately filed motions to remand all the cases back to the State Court of Chatham County. This week in north Georgia there was a fatal crash between a tour bus en route to a North Carolina casino and a tractor trailer blocking traffic lanes while waiting to turn left. This happened on Georgia Highway 515 (also known as the Zell Miller Mountain Highway) at the intersection with Whitestone Road in Gilmer County. The bus driver was killed and 43 passengers suffered a variety of injuries. 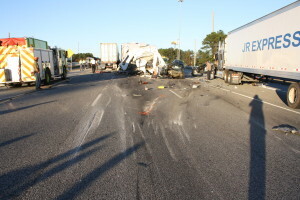 The preliminary investigation by the Georgia State Patrol blamed the truck driver. Troopers reported that the truck driver was making a left turn onto Highway 515 southbound when he paused for traffic, leaving the trailer projecting across and blocking northbound lanes. The northbound bus driver was reportedly unable to avoid crashing into the truck’s trailer. However, first reports are not always conclusive. This crash highlights issues with both tractor trailer operation and tour bus operation. 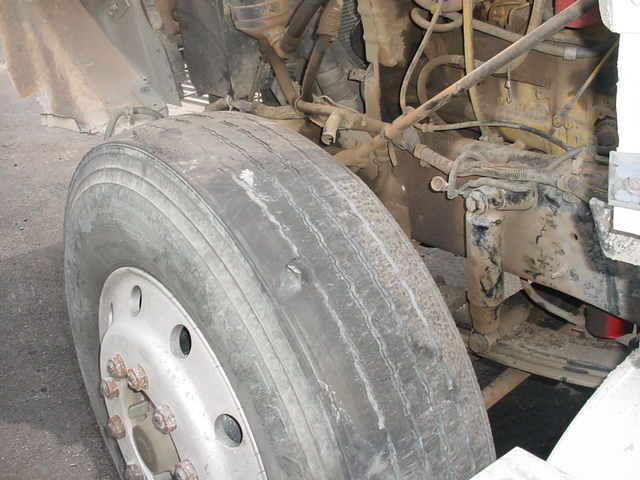 Photo our expert used to identify negligent maintenance issues even though trucking company had sold their dump truck out of state. Tom was having a good day. Between sales calls, he stopped his pickup truck at a red light at the end of bridge waiting to turn left onto a freeway ramp. He had been sitting there about thirty seconds when he heard a loud screeching sound. A dump truck fully loaded with gravel crashed into his rear, crushing the bed of his pickup and knocking the top of his toolbox through his rear window. By the time Tom hired us, the dump truck company had sold the truck and “lost” all the maintenance records. However, we had an expert who could tell from photos of the property damage that there were rusty cracks in mechanical components that may have contributed to the crash. While driver distraction and speed were bigger parts of the case, proof of poor maintenance helped establish that the company had been sloppy about safety for a long time. Although many of the commercial truck crash cases we handle are caused by some combination of speed, fatigue or distraction, some also involve mechanical failure. That may be discovered by a motor carrier enforcement inspection after a crash, in an expert inspection we arrange if we are hired quickly enough, or it may be disclosed later in expert examination of photos of property damage. 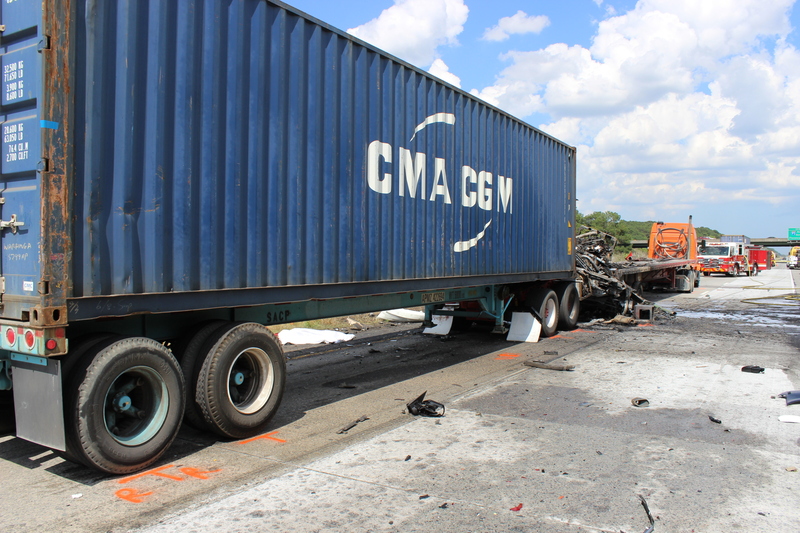 Truck crash on I-16 at I-95 on 5/19/2015 killed 5. Truck driver admitted falling asleep, is charged with 5 counts of vehicular homicide. 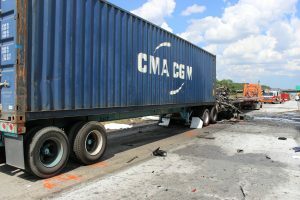 In the spring of 2015, there were two separate five-fatality truck crashes on I-16 in Georgia. The first one got most of the publicity because the victims were all beautiful young nursing students, but both were equally lethal and egregious. In both cases, there were at least indications that a truck driver fell asleep before running over a line of stopped traffic. On April 22, 2015, in Bryan County, John Wayne Johnson, a truck driver from Louisiana driving for Total Trucking, a subsidiary of US Express, ran over vehicles stopped traffic. He killed five Georgia Southern University nursing students and injured two others. It appears he went to sleep as there was clear visibility on a long, straight stretch of road before he ran over the stopped vehicles. Johnson admitted he had been texting and exchanging sexually provocative message with a woman while driving but denied he was on the phone at the time of the crash. People may enjoy watching “Ice Road Truckers” on television. But there is nothing entertaining about a tractor trailer bearing down upon you at excessive speed, out of control on an icy highway. A truck driver from Georgia has been charged with three counts of “three charges of grossly negligent driving with death resulting,” the Vermont equivalent of vehicular homicide. Last December 29, Lashawn Jones, 41, of Alpharetta, Georgia, was driving Roehl Transport Inc. tractor trailer on slush and ice on U.S. 4 near the Killington Ski Resort in Vermont. The truck driver lost control on slush and ice and collided head on with a vehicle occupied by three people – Ryszard and Anita Malarczyk from Hastings-on-Hudson, NY, and their friend, Jaroslaw Karczewski from Poland. All three were killed in the crash. What are the main causes of large truck crashes? Imagine that a commercial airliner crashed every other week in the United States, month after month, year after year. That is the level of carnage we have today in large truck crashes on America’s highways. In 2013, there were 3,964 people killed and an estimated 95,000 people injured in crashes involving large trucks, according to the National Highway Traffic Safety Administration. That year an estimated 342,000 large trucks were involved in police-reported traffic crashes during 2013. Of the fatalities in 2013, 71 percent were occupants of other vehicles, 17 percent were occupants of large trucks, and 11 percent were nonoccupants. In our law practice, we see a portion of this carnage all the time. After years of seeing the aftermath of immeasurable damage to human bodies, and tucking into sealed files the photos I can never show to family members of the deceased, I still cringe at those sights. Last week in Cherokee County, a Comcast truck failed to stop behind a car that had stopped to turn, went into the opposite lane, and struck head-on an oncoming car, killing the driver. According to media reports, at the intersection of Ga. 140 and Avery Road, a Ford Fiesta stopped to turn left onto Avery Road just before 12:30 p.m. on September 28, 2015. For unknown reasons, a Comcast truck steered to the left to avoid hitting the Ford and traveled into the westbound lanes striking a Chevy pickup head-on. The driver of the pickup — who I understand was a really good guy with whom I have several friend in common — died at the scene of the crash. The driver of the Comcast truck and an occupant of the Fiesta were also injured. Once again, a tractor trailer making a u-turn in dark or fog on a rural Georgia road has proven fatal. Once again, a turning tractor trailer forms a deadly and virtually invisible fence across a highway. 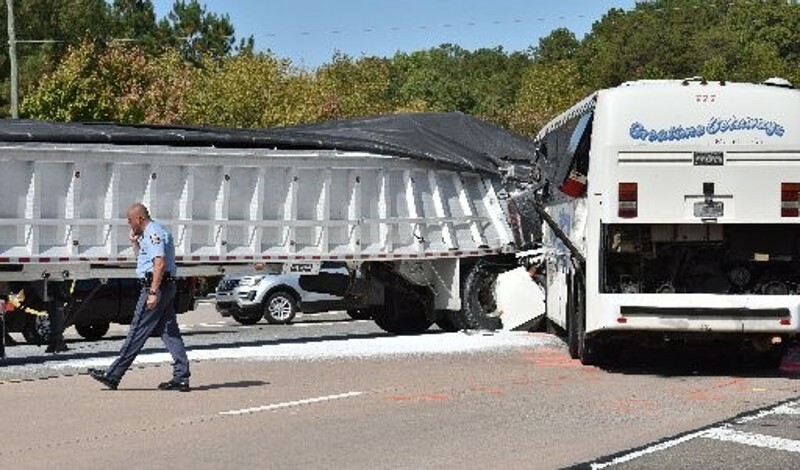 On September 30th at Lenox, Georgia, a man was killed when he collided with a Scruggs Concrete semi-truck attempting to make a u-turn in the roadway in foggy conditions. He was killed when the collision sheared off the top of his pickup truck. This is an all too common form of truck crash across the United States, largely due to poor training and management at companies that operate the trucks. 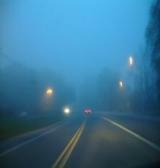 Distracted driving accidents often involve cell phones, texting and other electronic devices. For example, we recently concluded a case in which a truck driver was talking on his cell phone with someone in South America for nearly half an hour before he ran over a line of stopped traffic. But something as apparently innocuous as eating and drinking is very often a fatal distraction too. We have had several cases in which a truck driver leaned over to pick up a dropped water bottle when he ran over other vehicles, killing or seriously injuring the occupants. 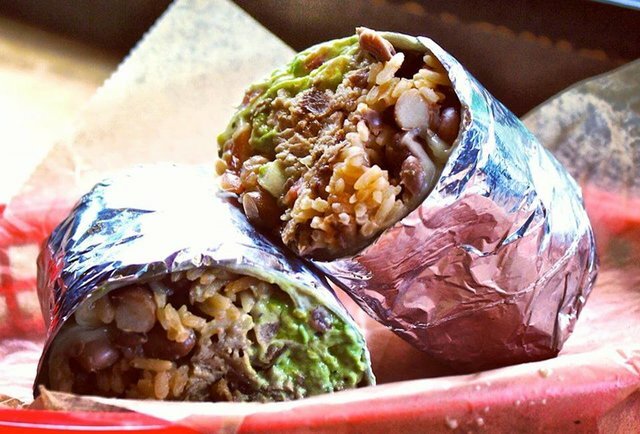 In this recent case in Albequerque, New Mexico, a bus driver was caught on video eating a burrito with both hands when he crashed into another vehicle and caused a chain reaction with other cars.